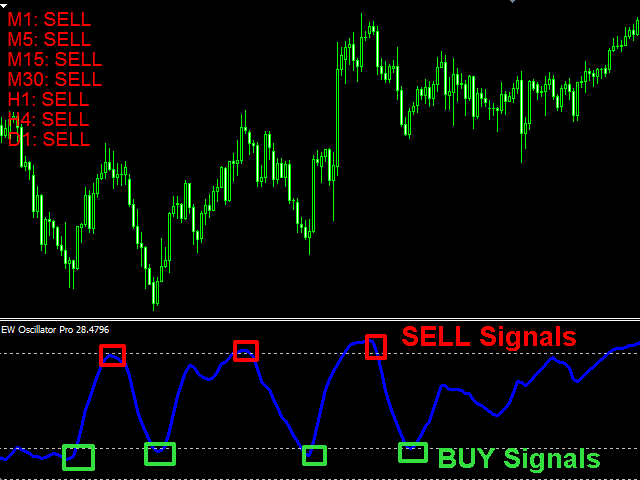 EW Oscillator PRO is an indicator for MetaTrader 4 based on mathematical calculations on the price chart. This is one of the most common and useful indicators for finding the trend reversal points. EW Oscillator PRO is equipped with multiple types of notification (push notifications, emails, alerts), which allows opening trades in time. 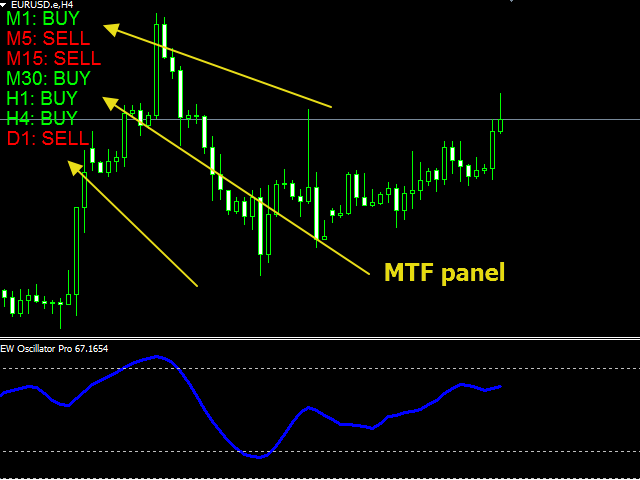 A panel for displaying the information on the indicator signals from different timeframes is located in the top left corner (see screenshot #2). Simple and convenient information panel. Suitable for working on the smaller timeframes (up to H4). EURUSD, EURGBP, USDCHF, AUDNZD, AUDCAD, GOLD. The buy signal is formed when the level 20 is crossed. The sell signal is formed when the level 80 is crossed. ColorEW - indicator line color. UpperLevel - the upper level displayed in the indicator window. When this level is crossed, notification are sent (mobile, email, alert). LowerLevel - the lower level displayed in the indicator window. When this level is crossed, notification are sent. MTF panel - display the information panel. Select true to display the panel, select false to hide it. Fixed display of levels in the strategy tester.